•Christmas Choose Your Side: Everyone stands up and you call out two items, like candy canes and fudge. As you call them, point to one side of the room for candy canes, the other side for fudge. Everyone has to split and go to whichever side of the room matches what they like better. Then call out two more items as you point, like snowmen or reindeer. Again, everyone has to go to the side of the room that matches what they like better. As you continue to play, everyone has to move around a bit and get to know each other’s preferences. •Stand Up, Well I Never! Everyone stands up, one by one you say something you’ve never done. If someone in the group HAS done that, they sit down. Last person standing is the winner. 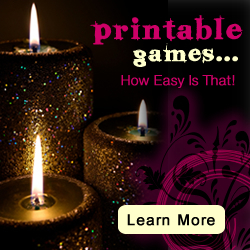 •Mind-teaser games are excellent when party guests are just gathering and everyone is waiting for others to arrive. 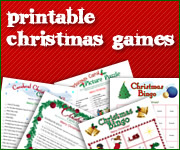 •Name that Christmas Song: Have your ipod or phone preloaded w/ Christmas songs. Play the first 10 seconds, and see who can guess the name of the song. Extra points for the artist. When the guests arrive, give them the following list. Match the statements on the list with the items on the table. Email everyone in the company a short request to send you one or two trivia details about themselves and give an example of what you are looking for: I have played Santa 3 times in past 10 years, or I traveled to South Pole, I go caroling every year. Ask them to keep their info related to winter, Christmas holidays, winter travel etc. Then type up a sheet of paper with two columns: One column will have the trivia statements and the other will have employee names paired with a number. The person who gets the most answers right, wins. Put non-fragile Christmas items into stockings, then tie off with a ribbon. Break into teams – each team with their own stocking – and see if the team can figure out what’s in the stocking. Put an orange in the hose, tie it around waist. Without hands, must knock a separate orange on the floor across a line. Make small chains of about four people holding on to each other by linking elbows. The end person has a tail (bandana) in their back pocket. Teams must stay linked to participate. The object of the game is to steal other teams tails while avoiding other teams who are trying to steal your tail. The last team to have a tail, wins. Each participant blows up a balloon and ties it with a bit of string to his/her ankle. On the given command, the guests – only using their feet- try to stamp other’s balloons, while also trying to be the last person to have their balloon unpopped. As survivors get fewer, reduce the playing area. Turkey Football Thanksgiving by on November 17, 2011 in Fall, Harvest & Thanksgiving Ideas Be the first to Comment! We love the idea of a fun American tradition, which means we are even more in love with the idea of two American traditions smashed together for one crazy festive bash. And it just so happens that it’s that time of the year for Thanksgiving and football! If you’re bored of the same old Thanksgiving hum-drum of bringing a dish to pass and gossiping with family members, turning the event into a Thanksgiving + Football = lots of fat and happy partygoers could make this year’s Thanksgiving get-together just a little more interesting. 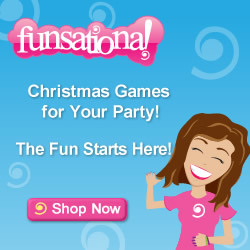 By mixing up some festive Thanksgiving games with the football games, it will vary the normal routine of the party. Plus, if you have kids in attendance or grown ups who aren’t as interested in watching the big game it will give everyone something to do! 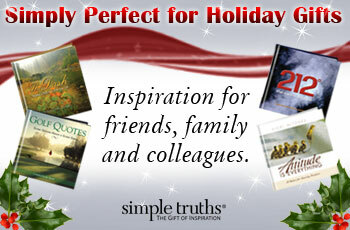 Here is our inspiration of how we’d put together this festive shindig! In this photo: roasted turkey, football + turkey games, football table decor, chocolate football strawberries, legwarmers, veggie tray, chicken wings, footbal sandwiches, football cheese ball, football wreath. Posted In: fall & harvest party, thanksgiving games share Santa Hat Office Christmas Party by on November 16, 2011 in Christmas & Holiday Party Ideas Be the first to Comment! Head on over to your nearest Christmas Shoppe and you’ll find stacks of Christmas hats…my eyes about popped out of my head when I saw the selection at Hobby Lobby. That’s right, Hobby Lobby, a craft store. And that’s when I fell in love with the Santa Hat theme for an office party! Simple…host your office party anyway you like – at the office, at another venue, potluck at lunch, whatever. But make sure everyone wears a santa hat. Easy enough? You’ll need everyone to be wearing a hat, so ask everyone prior to the party to wear a Santa hat. This game is based on observation. The objective is NOT to be the last person left with a hat on. At the start announce the simple objective, the only rule is that no one can take their hat off until you (the hostess) have. Let another game or conversation take place, and as time goes by, people will take their attention off you, and even forget the game is happening. Eventually, remove your hat and watch as people catch on. Gradually the hats will come off, amidst snickers and smirks. Some unsuspecting person (who’s probably busy boring everyone with a hopeless story) will be last to notice, and much to every ones mirth, this person is the loser. Serve up an appropriate forfeit, get the hats back on and give the loser the chance to start the next game. 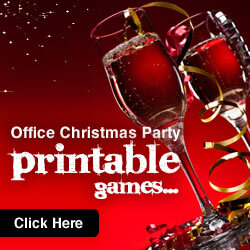 Posted In: christmas party games, office christmas party share Office Christmas Party Games by on November 15, 2011 in Christmas & Holiday Party Ideas Be the first to Comment! With over 100 people at an office, have one or two party starters, then break off in tables and play games at the table. Finish with a raffle. If you no space, for example a sit-down dinner at a venue, consider pencil and paper games before food. Sets the mood. Maybe the santa hat game. 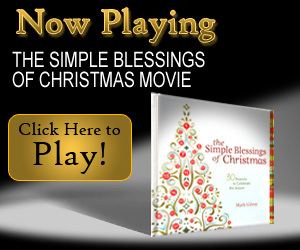 The Simple Blessings of Christmas movie ~ The blessings of Christmas are all around us. A song on the radio, a message from a family member or dear friend-distant or near, the aroma of Christmas dinner and so much more. The Simple Blessings of Christmas movie reinforces the true meaning of the season. Enjoy!